Steve Trumbull, the town supervisor, said the town board should be able to vote on the revised deal at its meeting Feb. 10. In the meantime, Trumbull said he will be working with the town attorney to address the contract's handling of buffers around the edge of the property. Briefly in Tompkins notes that the SPCA will be having a meeting at their building (map) to discuss an off-leash dog park for the county on Wednesday at 6:00pm. This is also tax-free shopping week on clothing. Dryden residents who live in the Ithaca City School District may be interested in the earliest budget projections for next year, which show a possible 6.9% tax hike. The Zoning Board of Appeals is meeting tonight at 7:30pm at the Dryden Town Hall (map). 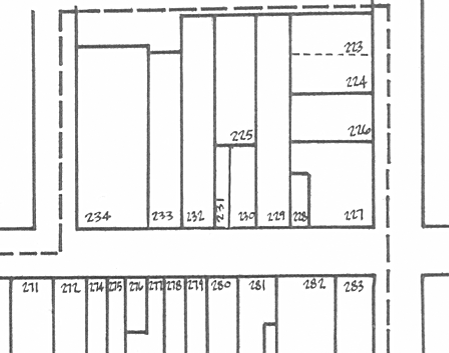 Will consider the application of The Strebel Planning Group requesting permission to establish an off-street parking facility which provides 18 conforming parking spaces where 37 spaces are required, at 944 Dryden Road, a variance to Section 1401.10 "off-street parking" of the Dryden Town Zoning Ordinance. The Zoning Board of Appeals is meeting tonight, February 1st, at 7:30pm. The Recreation Commission is meeting on Wednesday, February 9th at 6:00 pm, in the Dryden School District Office Conference Room. The Town Board is meeting at 7:00pm on Thursday, February 10th for their regular meeting. The agenda is not yet posted. On March 2nd, at the Dryden Village Hall (map), the Town Board and Village of Dryden Board will have a "Joint public hearing... on the annexation petition of Dryden Mutual Insurance Company for annexation to the Village of Dryden of Town of Dryden tax parcel #38.-1-30.13, containing approximately 6.04 acres and fronting on Ellis Dryden in the Town of Dryden." The Youth Commission will meet next on February 15th at 6:30pm. The Planning Board is having a "Hearing on the proposed comprehensive plan" at 7:00 pm on Thursday, February 17th at Neptune Hose Company (map). "I've been somewhat discouraged to see the level of involvement in politics, especially in my generation. I want to set an example that you should be active," he said. Freeville incumbents Rachel Dickinson and Thomas Lyson both plan to run again, and challengers can file petitions there until February 8th. Freeville uses a non-party system for its elections, so you don't need a Democratic or Republican nomination. Cathy Wakeman reports on a Cub Scout pinewood derby, as well as a pancake breakfast Sertoma will be holding at the Neptune Hose Company. (map) on Thursday, February 3rd, from 8:00am to noon. (I thought the sign at Clark's said February 5th - I'll have to find out.) Update: the sign at the fire hall says February 5th, Saturday. 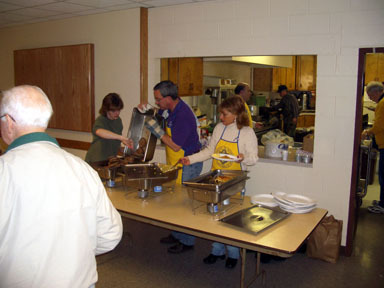 Briefly in Dryden lists a dish-to-pass supper at the Etna Community Baptist Church starting at 12:30pm on February 6th, and a Club Dryden event for middle-schoolers at Dryden Central School on Saturday, February 5th from 6:00pm to 9:00pm. There's also a pancake breakfast listed in Best Bets at the Freeville Fire Department from 8:00am to 11:00am on Sunday, February 6th. The County Legislature approved a new mental health commissioner as well as $19 million in bonds, $16 million of which are for the planned emergency communications system. In its editorial, the Journal looks at the popularity and problems of modified sports programs. I am very, very skeptical of the so-called plans to privatize. And I think a disservice is being done to a great many Americans by sort of sounding the alarm that everything�s going to hell in a hand basket and we�re going to be broke by 2018. That simply is not so. Boehlert said he needs to hear more details before deciding whether to support the plan. But he praised Bush for trying to tackle the politically difficult issue. I guess it's time to write the Congressman again to try to get a straight answer, though I never did get an answer to my prior letter about the transportation bill. (Update: One of Boehlert's more conservative colleagues appears to have been punished for that episode.) I'd like to know just how far we can expect his moderation to go, and under what circumstances. I'm sure he's in a difficult position. Update: I've written Congressman Boehlert a letter, and I'll post any replies I get. This morning's Journal reports that Mao-Sheng Lin was convicted of kidnapping in a robbery of the Song Tao restaurant in November 2003. Lin had disappeared after posting $200,000 in bail and was returned from Texas in November 2004. Two other suspects pleaded guilty earlier. An article on students raising money for tsunami aid includes a list of student projects at area districts including Dryden and Ithaca. Briefly in Tompkins notes that there will be a presentation on biodynamic farming tonight at the Stone Circle School (map). The Monitor reports that a TC3 student reported a wallet stolen from a locker room. "It sounds to me like you want to cut down on the cost," said Michael Lane, D-Dryden. Finally, there's an article in which local Congressman Sherwood Boehlert, Chairman of the House Science Committee, questions the cost and value of saving the Hubble telescope. Yesterday I wasn't too sure where Congressman Boehlert stood on the President's plans for Social Security, having gone from "very, very skeptical of the so-called plans to privatize" to "prais[ing] Bush for trying to tackle the politically difficult issue." Rep. Sherwood Boehlert, R-New Hartford, cheered the White House's goal of revamping the benefits program. "We must strengthen Social Security for all Americans, and I couldn't agree more," Boehlert said. I guess the moderate Republican has set aside his concerns to be a Republican first and foremost. I'll be curious to see what he says if he replies to my letter, and what impact this has on future elections for him. Sherwood Boehlert -- a Utica-area Republican -- says he was "disappointed" that a few Democratic lawmakers greeted the president's call for social security reform with a chorus of "No!" Boehlert today told a Binghamton radio station (W-N-B-F) that he didn't think the State of the Union presentation was -- in his words -- "the place for that type of conduct." The congressman said opponents of the president's position can't ignore the reality that there are long-term problems facing the Social Security system. Maybe Boehlert never joined his Republican colleagues in booing a State of the Union address, but the last paragraph is definitely a contradiction of his earlier remarks. "[The President's] message to Congress was clear � we must strengthen Social Security for all Americans � and I couldn�t agree more. As legislators it is our responsibility to debate all proposals from top to bottom. Americans have a right to a safe and secure retirement, and we will protect benefits for retirees and future retirees. It would be a major injustice to all Americans if we don�t act now - the worst thing we can do is nothing at all. Americans deserve the peace of mind of knowing they will receive full benefits for their retirement." Thanks to Josh Marshall again for pointing this out. I think it marks a complete 180-degree shift from his earlier position that "a disservice is being done to a great many Americans by sort of sounding the alarm that everything's going to hell in a hand basket and we're going to be broke by 2018. That simply is not so." A piece of the map of Village of Dryden Land Use from the 1968 Dryden General Plan. As there was for the Town, there's also a list of numbered buildings corresponding to the numbers on the map - today's Time Square Park was #227 and #228 - a Service Station and Beauty Salon. #234 was (and is) Southworth Library. You can get a pretty detailed idea of what was here (and what wasn't) in 1966, the year the field survey was done. The Village has added streets since this map was made - Greystone Drive, Brookside Drive, Goodrich Way, an extension of Hilton Road, Penny Lane, Logans Run, Tannery Circle, and more. 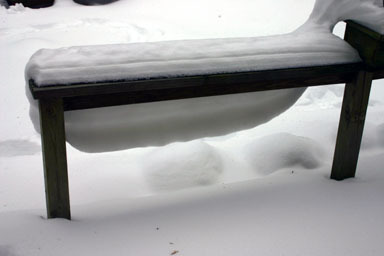 Along sidewalks or roads, old snow tends to be brown and slushy. Left in a pristine state, however, it can develop its own strange magic. 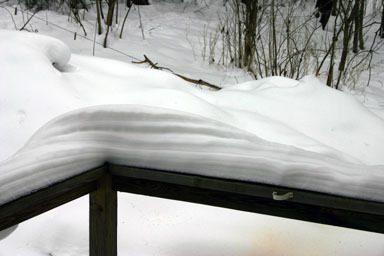 A canyon wall of snow. It's very different from last year's canyons. 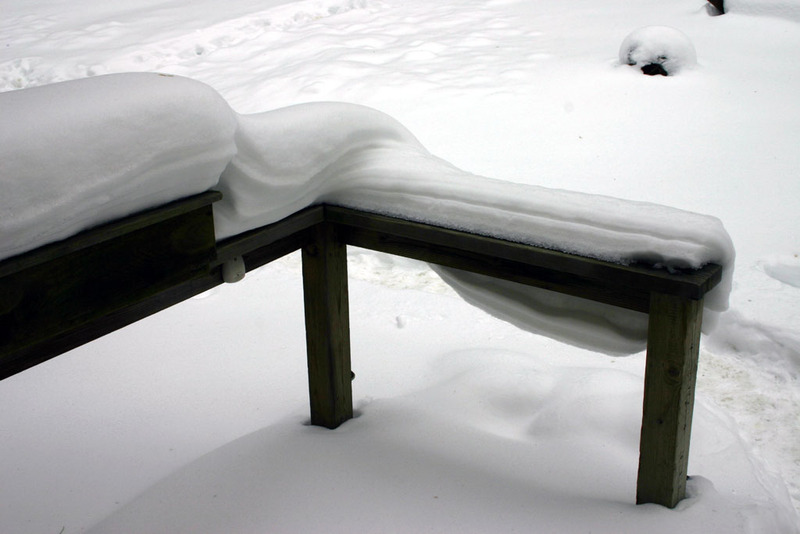 Most of these melted away or collapsed over the course of today's thaw. I don't often find news in the paper that would make my dogs happy, but today they're lucky: the Journal reports that the Tompkins County SPCA is considering creating an off-leash dog park on 12 acres of its own land. Muncipalities and the state haven't been particularly interested in the idea, and while the SPCA facility isn't convenient to the entire county, it's definitely convenient to Dryden. There's still a long way to go, however: "Research is in a very early stage, and no timetable has been set." Briefly in Tompkins notes that the annual Dryden Sertoma Club pancake breakfast will be tomorrow from 8:00am to noon at the Neptune Hose Company (map) in Dryden. Dryden schools are mentioned in an article about physical education classes. I jog most days from my home on Quarry Road along Snyder Hill Road to Sodom Road, which is about five miles from the East Hill Plaza. These roads regularly gather a variety of litter -- including a lot of Burger King packaging. Every month, I fill between one and three large garbage bags with refuse thrown from car windows. Even though the sight of this garbage is offensive, I haven't complained. It is the people who litter this trash without moral qualm who need to be addressed. I do feel Dryden sports may need to do a little more scrutinizing of the selection process for their team sports. Update: I forgot to mention the Journal's editorial about fund-raising for SUNY schools, which mentions Governor Pataki's veto of $10 million for TC3's expansion. Enjoyed your clever and off-times amusing comments. But shame on you for taking anyone to task for talking about our "responsibility to debate all proposals from top to bottom." My commitment is not to a specific course of action at this juncture other than to acknowledge a future problem and a determination to get going toward the development of a solution. Don't count me out yet! I think it's fair to say that the Congressman is spinning at this point, in many different ways and directions. Maybe he'll give me a straight answer when he replies to my letter, but I can't say I'm counting on it. Boehlert believes Bush is right to move now to strengthen the Social Security system. But the congressman says he wants to see more details about the personal savings accounts, which would allow people to invest a portion of the taxes they pay into Social Security. He fears that the diversion of funds to private accounts could lead to cuts in Social Security benefits. "I don't want to engage in a crapshoot with people's benefits," Boehlert said Jan. 18. "The whole scheme of privatization deserves exactly what it is going to get: a full and open airing." Boehlert voiced skepticism last month about the idea of private investor accounts, saying he didn't want to "gamble" with Social Security. After President Bush's State of the Union address this week, Boehlert's tone was far different, saying he "couldn't agree more" with the president's push for changes, though Congress still needs to review all the details of the proposal. His spokesman, Sam Marchio, declined to comment Friday on the TV ads, but said the congressman "applauds the president for placing Social Security reform at the top of his agenda, and agrees that we need to strengthen Social Security now rather than later." The Ithaca Journal's weekly history column visits Dryden's eight square schoolhouse today, talking with one of its last (1941) students. the person who hit my husband with a red pick up truck with a plow as he was walking across Aurora Street at the base of State Street on Tuesday Jan. 18. You drove off without stopping. There's also a laurel from the SPCA to people who had their pets vaccinated at a clinic there January 26th. There's still an hour to get pancakes at the Sertoma pancake breakfast at the Neptune Hose Company (map). Enjoying pancakes at the Sertoma breakfast. 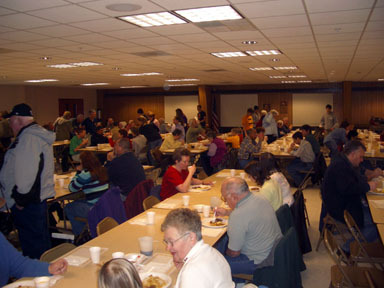 Volunteers serve pancakes at the Sertoma breakfast. I especially enjoyed the real maple syrup. This week it looks like I'll manage to cover the Dryden Courier while it's still available, unlike my way-late reporting of the previous two weeks. There's lots in it this week. The lead article look at the Help A Needy Dryden Student (HANDS) program, which began informally as the work of math teacher Howard Clafin, "has quietly diverted unused portions of the school's activities funding to families in dire situations," primarily emergency medical care. HANDS will now become a not-for-profit organization doing the same work, and is looking for sponsors. Yesterday's Sertoma pancake breakfast benefited the organization. Beyond Measure, the a cappella group at Dryden High School, makes the front page with the inclusion of their recording of "fever" on a Best of High School A Cappella CD. There's also a picture of the group inside. 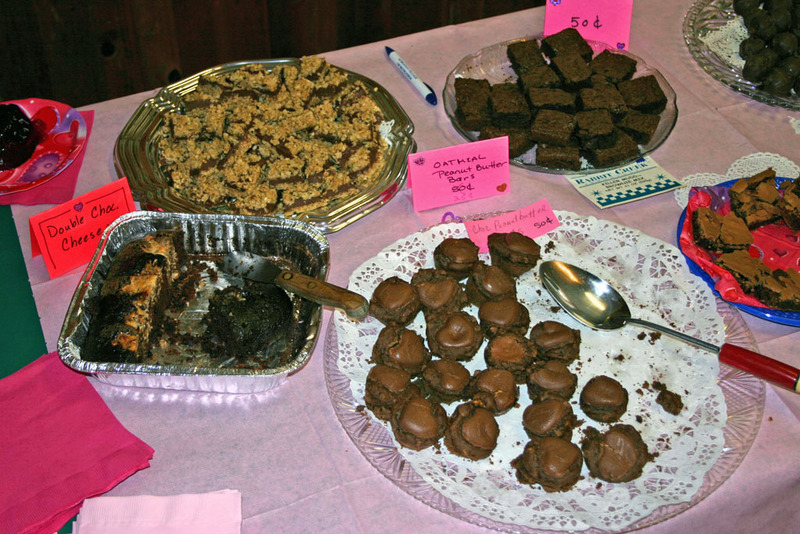 There's also an article on the fundraiser that the Dryden-Caroline Drifters snowmobile club will be having for the Ithaca Breast Cancer Alliance on February 26th, starting at noon at the Dryden VFW. For $15, it will be a "girls-only day on the trails," followed by a chicken and biscuit dinner. The South Central New York Dairy and Field Crop Team will be having a workshop on "Bringing Certifiable Land into Organic Crop Production" next Saturday, February 12th, at the Dryden Fire Hall (map) from 10:00am to 3:00pm. The announcement says that "Due to the rapid increase in the production of organic milk, there has been a corresponding increase in demand for organic feed-grain crops...[this workshop will] help farmers that have some land that meets certification standards to be a part of this rapidly expanding market." The workshop costs $10 and includes lunch. There will be another (different) workshop on organic crops on March 1st. The Dryden Youth Opportunity Fund is accepting a round of grant applications through March 31st for "innovative and creative programs that go beyond the basic educational requirements of public education." Applicants must be sponsored by non-profit or tax-exempt groups. The Dryden Soccer Club will be having its 9th Annual Indoor Tournament on March 5th at Dryden High School. The sports section covers the Dryden boys basketball team, with a team photo, article about a win over Trumansburg, and an action shot of Josh Erickson trying for a rebound against Elmira Notre Dame. The Town of Dryden has posted a revised version of its Draft Comprehensive Plan. This is the one document I'd encourage everyone interested in the future shape of Dryden (including the villages, even though they're not included) to read. The Planning Board will be having a public hearing on this document February 17th at 7:15pm at Dryden Town Hall (map) Neptune Hose Company (map). After the Planning Board considers public input, it will go to the Town Board for further hearings and possible adoption. The maps are probably the easiest things to look at, though it's worth emphasizing that the maps are not a direct template for the future. This plan does not specify how any of these things are to be implemented - that's up to the Town in future work, whether it's about zoning, road redesign, trails, or water and sewer systems. The lines on these maps have meaning only insofar as they inform those processes, not direct them. The first map is the Future Land Use plan. 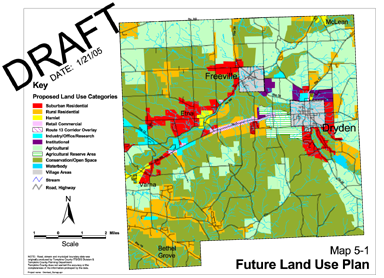 Key features include hamlets in yellow, areas planned for suburban residential development in red, rural residential in brownish orange, commercial in pink, and industrial in blue. A thick yellow line indicates areas where Purchase of Development Rights (PDR) applications are underway, which may make those undevelopable except for agriculture. (Update: The PDR process continues; they're just not on this map.) The light green is agriculture, while the dark green is conservation and open space land. Proposed future land use in the Draft Town of Dryden Comprehensive Plan. In addition to the lands designated for Suburban Residential uses in this Plan there is an area of approximately 910 acres of land immediately west of Dryden village that is designated as an Agricultural Reserve area. From an overall land use standpoint these lands are well suited for development as future residential neighborhoods. Yet at the same time they are high quality agricultural lands that are owned and farmed by families that are committed to continue farming their lands. To balance these two competing interests the Town should treat these lands as if they were designated for agricultural uses and apply the actions and policies recommended in the Agriculture section below to these lands. Not including these lands in the "development" land use categories will not have any measurable impact on the Town of Dryden's ability to accommodate all expected future growth and development. In future decades, however, should their use for agricultural purposes be abandoned then they can be treated as other lands in the Suburban Residential category. There is also a "Route 13 Overlay" area that covers a part of the town that has had conflicts over the mix of residential and commercial development. The plan (on pages 62 and 63) sees the overlay area as remaining mixed, but encourages the Town to develop standards for this area that will protect residents and prevent traffic congestion. The next map of Dryden's possible future shows potential park and trail locations, as well as places where intersections need to be reconsidered. This map has changed substantially from its predecessor. Oddly, just as the Town considers putting park land next to Town Hall, the asterisk showing a park there moved out to the east. This map also shows a lot more proposed trails than its predecessor, many of them following powerlines across the town. Most of the new trails will be more primitive trails, not the more heavily-built trails that run over railroad beds. I'm intrigued, and wish those trails were more accessible to my house, but I'm sure there will be a wide variety of opinions on the subject. 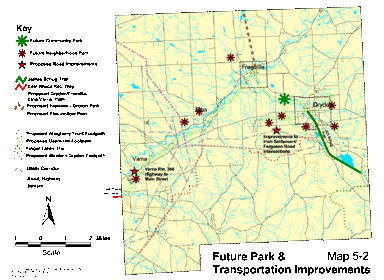 Proposed future park and transportation improvements in the Draft Town of Dryden Comprehensive Plan. For much more information on the trails and parks shown in this map, see pages 68-76 of the plan. The last map of the future Dryden is the map of possible water and sewer service. It shows areas where development and proximity to existing water and sewer systems make further development economical. Readers in the villages of Dryden and Freeville should definitely take a look at this, as their systems may expand over the long term to support this potential development. Some people will probably just see rising costs, while others will hope that this spreads existing costs over more people. There's a lot to think about. 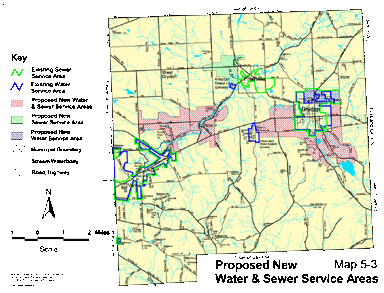 Proposed new water and sewer service areas in the Draft Town of Dryden Comprehensive Plan. I haven't had a chance to read the complete new draft yet, but I'll be doing that and writing more about it here over the next week. I'm especially interested to see how the sections on hamlets and agriculture turned out, as those were two of the most contentious. (I'm especially happy that there is a version highlighted for changes.) If you'd like some background on this document, you might try the planning and zoning archives of this site. The only explicit mention of Dryden in today's Ithaca Journal is in a report on recent ticketing of dog walkers at Allen Treman State Park who were allowing their dogs off-leash mentions the prospect of a dog park at the SPCA in Dryden. In a set of articles about pedestrian-automobile accidents, the Journal writes that Tompkins County has reduced fatal vehicle crashes far more than the state average, which Captain Mark Dresser of the Sheriff's Department attributes to enforcement. There's also an article on the increased number of boarded-out inmates since the state removed variances after the county legislature voted not to continue building the size of jail the county wanted. The state effectively doubled the number of days inmates were boarded out in January by initially cutting the jail's capacity from 103 to 58, before returning it to 73, its earlier capacity without variances. The cost of boarding so far seems to be $16,485, much less than the county legislature budgeted, but there may also be overtime costs for deputies involved in transporting prisoners. This morning's Ithaca Journal includes a profile of TC3 multicultural coordinator Jean D'Arc Kakusu Campbell, exploring how a man born in the Democratic Republic of Congo came to Dryden "to make TC3 a place that embraces and celebrates every culture." The 71 kids who live in Varna west of Forest Home Drive to Wing Road, who currently attend Cayuga Heights, would instead go to Belle Sherman. An article contemplating the Lenten tradition of reflection and penance and how similar traditions run in several religions visits the Foundation of Light. Briefly in Tompkins notes that "the Tompkins County Legislature is inviting community members to apply for a seat on the Community Mental Health Services Board." Ithaca City School District open enrollment forms are also now available. 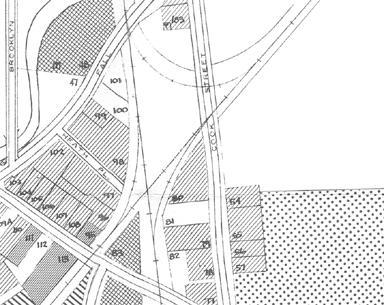 A piece of the map of Village of Freeville Land Use from the 1968 Dryden General Plan. Again, as there was for the Town and the Village of Dryden, there's also a list of numbered buildings corresponding to the numbers on the map - #83 and #84 were a lumberyard, hardware, and appliance store, while #48 is listed as Commercial (farm equipment and auto repair, junk yard, residence trailer). This morning's Ithaca Journal reports on last night's public meeting to discuss the possible annexation of an area north of Dryden to the Village. Dryden Mutual Insurance has applied to be annexed to the Village, and there are large questions about sewer and water service in the area. Annexing parcel by parcel is a slow process that costs a lot and makes planning and infrastructure difficult. The Town and Village Boards will have a joint meeting on March 2nd to discuss the Dryden Mutual petition. Working musical instruments hang on the wall and a piano is tucked in the corner. Goodband finds music an essential ingredient to any dining, or working, experience. Patrons are welcome to grab any of wall decorations and serenade patrons. On a recent Friday, a group of Dryden teachers tickled the ivories after a week of work and brought along a trumpet for a duet. Parents are unhappy about Ithaca elementary school redistricting, though only a sliver of the western edge of Dryden near Varna is affected. "Every decision on tax policy has winners and losers," said Martha Robertson, D-Dryden. She asked for such a list to be prepared when a study committee gives another report. I'm glad they're going slowly, in any case. If all the counties in the area went for this, it could be a good thing, but it may not make sense in the context of surrounding areas with different tax policies. Speaking of tax policy, Assemblywoman Barbara Lifton will be having a teach-in on federal and state tax policy on Saturday from 1:00pm to 4:00pm at the Women's Community Building (map). Meanwhile, State Senate Majority Leader Joseph Bruno is looking for "$7 or 8 billion" in revenue. The Journal's editorial suggests that healthy food may be a way forward for New York farming. Dryden Town Clerk Bambi Hollenbeck is among the signers of a letter criticizing the state for making decisions about voting equipment without any consultation with the towns and the possible centralization of voting machine ownership at the county level. This morning's Ithaca Journal has a profile and picture of Peter "Pete" Tyler, "the first African-American in IPD to reach the rank of sergeant." Tyler is a member of the Ithaca Police Department SWAT team, as well as a member of their recruitment team. He lives in Dryden, where he also volunteers with Neptune Hose Company. Freeville village elections appear to be uncontested, with incumbents Rachel Dickinson and Tom Lyson running again. The Ithaca School Board provided Superintendent Pastel with guidelines for redistricting planning, as well as a contract extension and a raise. Also, the Journal's editorial supports building a dog park, though in the current Cass and Treman Park location, not mentioning the possibility of a dog park at the SPCA in Dryden. The Town has posted the agenda for tonight's Town Board meeting, which will start at 7:00pm at the Dryden Town Hall (map). One of the public hearings listed is a continuation of a heated hearing from the May meeting, about a possible self-storage business on Oak Brook Drive off 366 near Varna. There's an intriguing bit about "Discuss Recreation Department�s Portable Ice Rink." Also, it's not on the agenda, but the 284 agreement outlining which roads will be repaired this year was postponed from last month. Speaking of last month's meeting, I lost my notes and didn't get to finish reporting on it beyond the discussions over the land purchase for the new Town Hall. If you'd like to catch up on what happened, the minutes for that meeting are available. A chocolate festival sounds like a great idea for February. 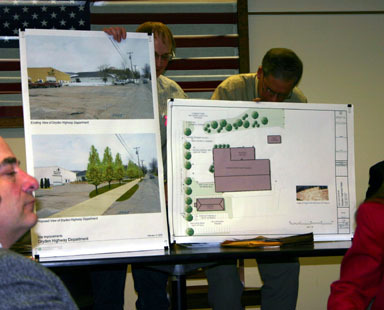 In an unexpected move, the Dryden Town Board went into executive session at the end of its meeting Thursday night without taking action on the proposed purchase of land for a new town hall. In recent discussions, town officials indicated that approval was imminent and that a decision would be made at Thursday's meeting. No explanation for the delay was available at press time. So I wonder if the scheduling means that the offer has been accepted. The article also looks at last night's lengthy continuation of a May public hearing on the construction of self-storage units on Oak Brook Drive, which were approved 4-1. Councilman Chris Michaels expressed misgivings about the applicant's activities during the permit process and doubts about the time given to consider the new proposal, though in the end he wasn't sure what a month would do. Neighbor Susan Boutros had asked for an extension of the hearing, having only received notice and the 200-page stormwater plan on Tuesday, but was denied. Military News recognizes two Dryden residents for their training achievements, and School News notes a Dryden resident at Keuka College. The Journal also reports on the complaints at Cass and Treman parks that have driven discussion of a possible dog park at the SPCA. Dryden residents past and present write the Journal today. Bill Clark, of Brevard, NC, writes to thank his neighbors on Mount Pleasant and Turkey Hill Roads for the water district that increased his taxes and drove him out of town, where he is apparently much happier. Two Freeville residents share contrasting views of national politics. Shirley Forsythe writes of the recent inaugural that "As George W. strutted, it was so hard to believe that so many saw him as a leader of the free world." Edgar Seymour writes to complain about "the arrogance shown by the area liberals" in their willingness to criticize conservatives. Most of the news section in today's Ithaca Journal is quiet on Dryden, but an obituary stands out. 81-year-old Dr. John Ferger, who had founded Dryden Family Medicine in 1955 and worked there since, died suddenly yesterday after spending "the morning seeing patients at the office". Calling hours will be Thursday, February 17th, from 2:00pm to 4:00pm at the Perkins Funeral Home (map). There's more on Fall Creek's flooding downstream in Ithaca. The Varna Community Association will be having a pancake breakfast tomorrow from 8:00am to noon at the Varna Community Center (map). Dryden Seniors will be meeting Monday at 11:30am at the Dryden Fire Hall (map) for lunch. Local elections hit closer to home than any state or national contest. While bureaucrats on Capitol Hill argue over policies that will never have an affect on our small communities, the local elections can affect decisions like local taxes, what kinds of improvements are needed on our streets, etc. While I suspect that Capitol Hill has more local impact than this editorial acknowledges, I like their general point: local politics matter in very direct ways. There's a level of concreteness in dealing with a smaller area and a smaller group of people that you just can't get at the federal or even the state level of government. The Finger Lakes Community Newspapers will print letters to the editor on any topic of interest to our readers. Letters must be signed and include a phone number for verification. Any letters that do not include a signature or a phone number will not be printed. Letters should not exceed 500 words. The editors reserve the right to edit any letters that exceed the limit. Letters that can be considered a personal attack will not be printed. They'll accept letters about Village of Dryden elections through Friday, March 5th. In the news, the Courier looks at two Dryden schools stories, with a profile of Cassavant Elementary School crossing guard (and all-around hard worker) Marge Albern and a story on student representation at the Dryden School Board, where Amanda Christofferson and Ryan Mott are liaisons. Mott is profiled this week, and Christofferson will be profiled next week. TC3 has a new writing certificate program, and there's an announcement of a session called "Does Higher Income Per Cow Interest You? If So, Let's Talk Grazing!" The session, which will focus on improving milk production from cows by having them graze. Some of the research that will be presented is from Dryden. The meeting will be held from 10:30am to 2:30pm on February 23rd at the Dryden Fire Hall (map), with a $3 charge for soup and salad. There's also a piece on the Tompkins County Legislature Public Safety Committee unanimously endorsing a resolution calling on New York State to abolish the death penalty. Dryden legislators Martha Robertson and George Totman were among those voting for the resolution. In sports, there's coverage of Dryden boys wrestling, including a picture of Dryden wrestler Anthony Jerome, and both a picture of the boys swim team and coverage of their preparation for the IAC Championships this weekend. We went to the Etna Chocolate Festival yesterday with friends, and were rewarded for our journey (and a small donation per piece) with a lot of different kinds of delicious chocolate. A variety of chocolates for sampling in Etna. 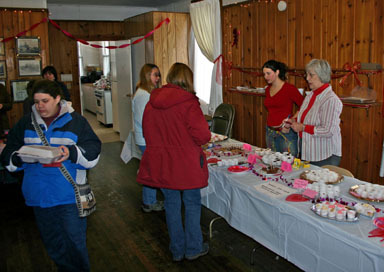 Gathering chocolates at the Etna Community Center for tasting. I asked Skip Thorne if they do this every year, and he said they don't always, but that they do hope to keep doing it. It's a great way to start the morning, and, I hope, a great way to draw people to community centers. I've also posted a brief gallery of more pictures from the event. Today's Ithaca Journal is the quietest for Dryden news I've seen in a while. About all there is is mention of a hearing on Ithaca School District elementary redistricting tonight from 6:00pm to 8:00pm at the district's administration building (map). The currently active plan for redistricting may affect a a few residents on the western edge of Dryden. Dryden's representative in Congress, Sherwood Boehlert, "did not provide a statement on his position prior to press time" for an article on the Bush adminstration's proposed cuts to the Community Block Development Grant program. Assemblywoman Barbara Lifton will be hosting a Town Meeting on Tuesday, February 22nd, at 7:00pm at the Dryden Town Hall (map). The poster invites attendees to "Voice Your Concerns." Lifton held a similar forum last year, and there was as lot of good information and give and take with the audience. In this morning's Ithaca Journal, Cathy Wakeman's Dryden Town Talk takes a look at Welsh pony trainer Amy Schwartz and rider Junelle King, National Grand Champion of the United States Equestrian Foundation Welsh Pony Division. Schwartz is raising 30 ponies at Kelviden Farm on West Dryden Road, and chairs a large Welsh Pony show at the State Fairgrounds. Wakeman points to the Kelviden Farm web site at the end of her article, and it's well worth a visit. The Planning Board will be having a public hearing on the Draft Comprehensive Plan on Thursday, February 17th at 7:15pm at Neptune Hose Company (map). I posted an introductory article on this last week. Alternatives Federal Credit Union will be offering free tax preparation for members of the community with low and moderate incomes on Saturday, February 19th, from 10:00am to 2:00pm at TC3 (map). 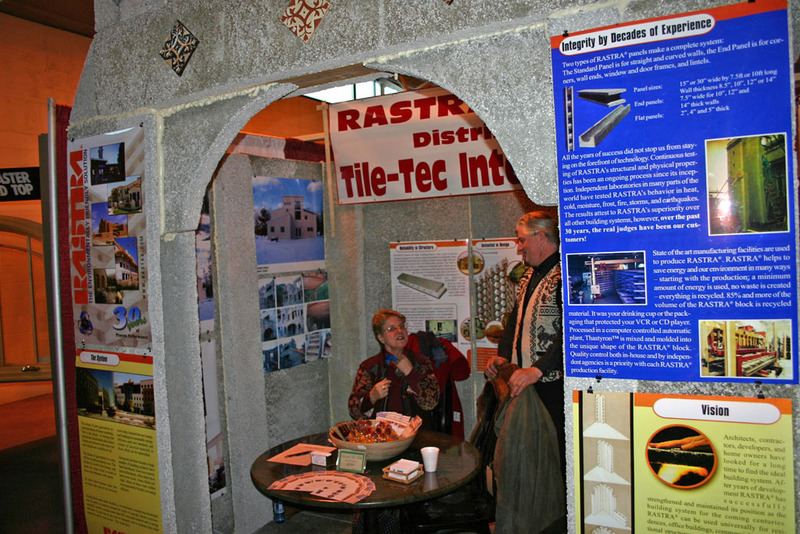 There will be a flea market at the Varna Community Center (map) from 9:00am to 3:00pm. Lunch will be available from 11:00am to 2:00pm. Assemblywoman Barbara Lifton will be hosting a Town Meeting on Tuesday, February 22nd, at 7:00pm at the Dryden Town Hall (map). She'll also be having similar meetings in Cortland, Virgil, and Ithaca. Briefly in Tompkins mentions that Congressman Sherwood Boehlert will be launching a monthly cable television show on local cable channels. Update: I forgot to mention the vote on Lake Source Cooling monitoring. Legislator George Totman voted against requesting that Cornell keep nine sites, Legislator Mike Lane voted for it, and Legislator Martha Robertson was absent. The Journal quotes Lane, who had earlier been sympathetic to a reduction to seven stations but not to two, as saying "I just have not been persuaded that we should change what we are doing." You are invited to a public meeting regarding reconstruction of Hanshaw Road between Sapsucker Woods Road and the Cayuga Heights Village Line, Thursday, February 17, at 7:00pm at the DeWitt Middle School Cafeteria, 560 Warren Road. Discussion will focus on issues of pavement and alignment; traffic volume, speed, accidents, and destinations; roadside hazards; drainage; pedestrians/bicyclists/safety; social concerns; aesthetics; environment; and local economy. Design will begin following the meeting. Design alternatives will be developed over the next several months and presented for public review in the late spring or summer. Construction is planned for 2006. Federal and state will fund up to 95% of the work. For more information, please contact John Lampman at Tompkins County Highway Division, 170 Bostwick Road, Ithaca, NY 14850, (607) 274-0307 or email at "jlampman@tompkins-co.org". It's nice to see a public meeting this early in the process. "Some of us have been hearing about the new assessments," Lane said. "I have talked to some other legislators and some feel differently about this than they did last year. I fully understand the argument on both sides, but I still make the argument that with the spikes in real property values, we need to slow the process down and give taxpayers a break." Lane will introduce a bill next month proposing the change. Yesterday's blustery weather caused problems for area motorists, and Bell's Auto Care is mentioned both for towing from an accident and with car maintenance tips for being prepared for winter conditions. There's another mention of tonight's hearing on the Draft Comprehensive Plan, which will be at 7:15pm at Neptune Hose Company (map). There's mention of a DWI on Route 13, and yesterday I forgot to mention one on Turkey Hill Road from yesterday's paper. The Ithaca School District has delayed their vote on elementary redistricting until March 15th or possibly March 22nd. There's also an article on Fall Creek flooding, well downstream of Dryden in Ithaca, which is also interesting because of the ways neighbors are communicating because of the flooding, and ways they wish they'd had advance communications from the city. 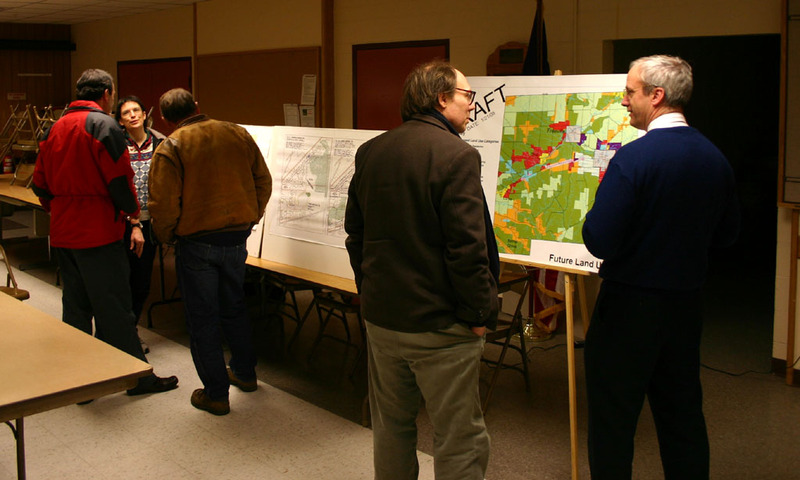 This morning's Ithaca Journal reports on last night's hearing on the revised Draft Comprehensive Plan. Residents expressed concern, and some hope, about changes that would eventually come to their neighborhood, and as the article notes, the Dryden Lake area was of particular concern to a number of speakers. One issue the Journal doesn't mention that's coming up quickly is resident Joseph Osmeloski's mention that the golf course on Dryden Lake will be up for public auction March 11th. I hadn't heard anything about the course in a long time. While Dryden residents were discussing their town plan, residents along Hanshaw Road were discussing the reconstruction of that road from the Town of Dryden line to Cayuga Heights. Thayer Construction -- Al & Robert Thayer and Dan Wheaton of McLean -- were honored for the contracting work that they have done over the past 10 years for the clients of Better Housing. The Journal's editorial, while not directly about Dryden, is about something Dryden residents do need to worry about: New York's ever-increasing and ever more creative pile of debt. I'm a little late getting to this for 2005, but updating last year's tax summary with 2005 data produces a table showing some troubling trends. While the County, despite its best efforts, failed to keep its tax levy increase at 3%, it slowed growth to 6.5% after two years closer to 20%. The Town's levy, on the other hand, increased by 7.9%, while maintaining the same tax rate. (Well, the rate increased 0.3%, but that's not much.) Increased assessments fed that increase, and looking around Dryden it's hard not to think those were mostly increased assessments on existing property, not new construction. The same pattern applies to the 2004 budget, though 2005 shows a slightly smaller increase, likely because assessments increased less. Dryden Ambulance went up 9.5%, though it's still coming back from the 48% drop in 2003. Taxes for the Fire Protection District (the area outside of the Villages, excluding McLean, which has its own fire district) fell 0.9%. That sounds good, except that last years's 31.8% increase included a lot of one-shot spending, and this year's was largely free of it, so the suggestion that last year was an unusual jump up that would fall back down doesn't seem to have held up. This week's issue of The Shopper includes an ad announcing "A Night for Remembering Bret Neff," the Harford volunteer firefighter who lost his life responding to a call in Slaterville last year. There will be a candlelight memorial service for Neff at the Harford Fire Station on Route 221 on Wednesday, February 23rd, at 7:30pm. The Shopper also has an ad for a Dryden Kiwanis Can & Bottle Drive, which will be at Clark's tomorrow, Saturday, February 19th, from 9:00am to noon. The Dryden Recreation Department has an ad announcing that graduate students from SUNY Cortland are conducting a phone survey on recreation opportunities in Dryden. The Dryden Soccer Club has an announcement of their March 5th tournament for both girls and boys indoor soccer. Completed rosters are due today. This morning's Ithaca Journal reports that Albert Miller, a trash collector was injured on West Dryden Road early on Thursday. The Freeville Fire Department and Dryden ambulance responded, and Miller was taken by helicoper to Arnot-Ogden hospital in Elmira. Briefly in Tompkins mentions the Dryden-Caroline Drifters Febuary 26th 2nd Annual Chicks Ride for women to raise funds for the Ithaca Breast Cancer Alliance, and also that forms for Ithaca School District open enrollment are available. In Darts & Laurels, County Legislator Martha Robertson thanks "the staff of Tompkins County and the Health Planning Council" as well as her fellow 2004 Health and Human Services Committee members for their work in creating the TompkinsRx drug discount card. Also in Darts & Laurels, Neptune Hose Company Chief Ron Flynn "would like to extend our sincere appreciation for the proclamation awards that were presented to several members of our organization on Saturday, Feb. 5 at our annual fire department banquet" to Town Supervisor Steve Trumbull and Village of Dryden Mayor Reba Taylor, and also singles out Town Board member Steve Stelick for praise among "the village trustees and the town councilmen... for their continuous support of the emergency services within our community." A letter from Robin Fisher Cisne of Cayuga Heights suggests that "Tompkins County has been very fortunate to have had John and Martha Ferger living among us these last 50 years, but John's untimely death last week has made it painfully clear what a blessing his life -- and Martha's -- have been, not only to us who have been privileged to know them, but to the First Unitarian Church, to the Dryden and Ithaca communities and, in fact, to the whole world." On a similar note, Jud Kilgore of Ithaca writes that "The bells are tolling loudly for John Ferger. The obituary that detailed his magnificent life covered the facts. No written words can truly capture the man." On March 1st, the Zoning Board of Appeals will return to discussion of the future of the largely empty duplexes on Observatory Drive off of Mount Pleasant Road. I'm afraid I haven't made it to the ZBA or Planning Board meetings on this subject, but I understand that one part of what they're hoping to do is split the duplex buildings into separate properties. It doesn't sound simple. PLEASE TAKE NOTICE_that the Zoning Board of Appeals of the Town of Dryden will continue a public hearing first conducted on 12/7/2004 to consider the application of Patricia Lucente, c/o 959 Dryden Road, Ithaca, NY who is requesting permission to further divide a developed property parcel a 9-11 Observatory Circle, Town of Dryden which will require area variance consideration and is requesting a variance to Section 702.3 & 703.2 & 703.3 of the Dryden Town Zoning Ordinance to do so. SAID HEARING will be held TUESDAY, March 1st, 2005 at 7:30 PM prevailing time at the Dryden Town Hall 65 East Main Street, Dryden, NY at which time all interested persons will be given an opportunity to be heard. Person may appear in person or by qualified agent. Individuals with visual, hearing or manual impairments and requiring assistance should contact the Town of Dryden at 844-9120 or 844-8619 at least 48 hours prior to the time of the public hearing. This week's Dryden Courier has lots and lots of Dryden news. The cover stories include a continuation of last week's profiles of the two Dryden student school board liaisons, focusing on Amanda Christofferson's accomplishments this time. The Courier reports that the Club Dryden event the town held on Febuary 5th was a huge success, with 240 participants instead of the expected 100. Parents have asked for more events. There's also discussion of the summer concert series returning to Montgomery Park, and of the Town Board's plans to assemble a committee to create a recreation plan complementing the Comprehensive Plan that may be nearing completion. Page 3 looks at changes in the Dryden school district's policy for handling extreme weather days when temperatures are cold enough that standing by the road for a bus is a bad idea, as well as at questions of Dryden Elementary's administration and overcrowding in its cafeteria at school events. The Courier also discusses County Legislator Mike Lane's presentation to the Town Board on the deal bringing Northwest Airlines to Tompkins County airport in May. Dr. Ferger did someting extraordinary, and this is what it was: he simply lived the life he envisioned. The purpose of this Local Law is to establish an additonal six (6) month moratorium on the filing, review and approval of any applications for permits and approvals related to the construction of new multiple residences within the Commercial Business Districts of the Village of Dryden. Such moratorium period is in addition to the currently pending six (6) month moratorium established for similiar purposes by Local Law 004 of the year 2004 and the preceding moratoria established for similiar purposes by Local Law 001 of the year 2004 and Local Law 003 of the year 2003. It is the intent of this Local Law to permit the Village to continue its ongoing review of its Zoning Laws and comprehensive Plan, including, but not limited to, (i) the appropriateness of various uses of property within areas zoned for commercial and business purposes, (ii) the appropriateness of multiple residences within Commercial Business Districts and issues of public health, safety and welfare related thereto, (iii) the adequacy of existing physical and financial resources of the Village to furnish essential services and facilities, (iv) the effect on the Village's aquifer, and (v) the desirability of additional non-owner occupied properties. Such review is still underway, preliminary reports have been prepared and submitted, grant funds have been obtained for further study, public comment and input has been solicited, and supplemental reports and recommendations are forthcoming. It is therefore hereby determined that the additional period of time covered by this moratorium is needed in order for the Village to fully and properly complete its study and review, evaluate the foregoing issues, consider amendments to its Comprehensive Plan and Zoning Law, elicit and consider further public comment, and/or adopt additional Zoning Law provisions. Pending completion of all of the foregoing, it is the further intent of this Local Law to continue to preserve the status quo. This will take the Village to two years of a moratorium on multiple residences, which makes me really wonder what's up with their Comprehensive Plan and Zoning Law. It also makes me wonder if they can extend this as long as they want, which I don't think is really the purpose of six month moratoria. This morning's Ithaca Journal reports that local fire companies had a lot of work this weekend. A three-car accident brought out the McLean and Freeville fire departments, as well as Dryden Ambulance and the New York State Police. A house fire in Slaterville brought out the Slaterville department as well as Harford, Brooktondale, Varna, Richford, and Speedsville tanker trucks. The Journal's editorial looks at the challenging task of Ithaca School District elementary school redistricting. 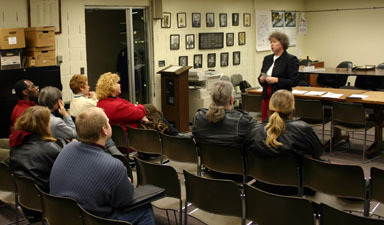 In Tompkins County, three libraries currently use a public referendum or a similar mechanism. Those libraries are the Groton Public Library, the Ulysses Philomathic Public Library and the Newfield Public Library. If the referendum is approved, the only municipality in the county that would not offer tax levy support is Dryden's Southworth Public Library. Steiner said that there are discussions in Dryden about offering a funding referendum in Dryden within the next two years. The Ithaca School District is looking at a revised elementary redistricting plan, though I can't tell from the paper's description how it affects (or doesn't affect) residents along Dryden's westernmost edge. An article on TC3 students volunteering in Nicaragua didn't make it on to the Journal's web site, but the program has been going on for ten years, bringing primarily nursing students to help in hospitals.. The Dryden Senior Citizens will be having a lunch on Monday, February 28th, at 11:30am at Neptune Hose Company (map). Casey Stevens of WHCU will be speaking. There will be a "How well is your water?" presentation at the Dryden Village Hall (map) on Tuesday, March 1st from 7:00pm to 9:00pm. Advance registration is required - email manager@cayugalake.org or call 532-4104. Participants will receive a 75% discount on bacteria and nitrate tests. The Dryden-Caroline Drifters will hold a Breast Cancer Ride for Research on Febuary 26th starting at noon. Briefly in Tompkins mentions a meeting about Six Mile Creek volunteer monitoring, to be held at 4-H Acres (map). on February 28th. There isn't a time given, but "for more information, contact Tania Schusler at 272-2292." 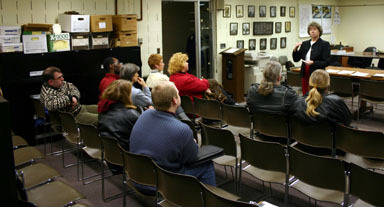 New volunteers are welcome, and will receive training like the training I covered last year in the spring. The last step in the professional work we're having done to our livingroom is complete: carpenters came yesterday from Perfect Painters/Heritage Builders and installed crown and shoe molding. Will and Luke transformed the look of the room in less than a day of work. The new trim, like the old trim, is pine finished with amber shellac. The crown molding was made at Danby Hardwoods, from a pattern in Shop Drawings for Craftsman Interiors. 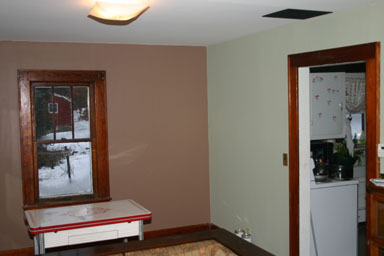 Ken from Perfect Painters stained it to match the orange of the old pine trim we have. I still have a lot of work to do cleaning up our old existing trim, but it's good to have the room's (re-)construction completed. As I did for the earlier painting, I've put up a gallery of pictures showing the work being done. The first few images are the trim before it was stained and finished, then the installation, then the results. I attended Assemblywoman Barbara Lifton's Town Hall meeting last night, and I'll have more about what she had to say soon, but what struck me most last night and what's still echoing through my head is attendance. Not counting Lifton herself and an aide, there were nine people there. Last year's Town Hall had more like 25 or 30, though some of them were there specifically about George Junior Republic labor issues. Last night's weather wasn't great, but I'd thought there was a decent amount of advertising and announcing. Assemblywoman Barbara Lifton talks to a small audience. It often feels to me that the only politics people are interested in is national politics. We hear about national politics all the time at every level of media, people from anywhere in this country can share conversation (or argument) about the same issues, and it feels very very important. This is big stuff, and even the bigger stuff of how we deal with the rest of the world all tends to be seen through that national prism. Unfortunately, apart from voting, giving money, and writing your Congressman (the latter of which I can't say I've found useful so far), we can all talk about national politics but it doesn't feel like there's a whole lot any single person can do to change it without devoting their life to it. We can make contributions to the conversations and the campaigns, we can share our opinions and hope that they're well-enough crafted to convince others, but a lot of the time national politics is like professional sports, and we're the audience. Looking at the other end of the spectrum, local politics is an arena where individuals, even individuals without years of training or continuous participation, can make a dramatic difference. Meetings are small enough that ideas can circulate and grow. Bringing five people to a town board meeting makes a substantial difference in the audience, and if a hundred show up, that's astounding. On the other hand, there isn't much media coverage, people often don't think it's particularly important, and there are natural limitations in what local government (municipal or even county) can do. The state level of government, at least in New York, seems to have the worst of both of these worlds. State government gets more media coverage than local government overall, but generally in terms that combine the sense of distance of national government with the mundane nature of local government stories. New Yorkers don't have much of a sense of commonality any more - Upstate vs. The City vs. The Suburbs make it hard for us to talk as a group about state politics. And perhaps worst of all, even voting doesn't have much of an impact in a system as thoroughly gerrymandered as the New York State Assembly and Senate. (Check out enrollment figures for Assembly and Senate districts if you need to verify that claim.) Districts are designed to minimize the impact of voters on their state government, and to ensure that existing majorities grow (in the Assembly) or survive (in the Senate). What we hear about New York State politics tends to be "three men in a room" making decisions, perpetually late budgets, authorities borrowing money to support that system and avoid constitutional limitations on borrowing, problems in the ever-growing authorities themselves, and a lot of news that doesn't make it sound like there's much room for citizens to change a system that's evolved its defenses over the past several decades. When excluding these obligations, New York�s debt burden has increased from $1,438 per person in SFY 1993-94 to an estimated $2,127 per person in SFY 2003-04. This debt represents 5.6 percent of New York�s personal income. However, when the debt from the sale of the State's tobacco revenue, prior year claims and nearly $1.5 billion in other obligations are factored in, debt as a percentage of personal income increases to 6.7 and debt per capita increases to $2,450. This is from the Comptroller's review of the enacted 2004-5 budget (402KB PDF), page 41. While it makes me happy to see that New York State is trending ever more Democratic, that political shift doesn't do much by itself to improve state government. While three Democrats in a room might produce results I like better than the current group, those three people are still going to have a lot to deal with. "Three men in a room" lacks legitimacy, and does little to involve the public in the debt mess we've created over the last few decades and to bring the public into the conversation about how we keep this state a place we want to live without heading into fiscal disaster. I'd like to end this on an upbeat note, but I have to admit that it's hard to find one. We've seen a few small steps toward opening government, but I don't see much interest on either the public's part or on government's part in bringing people closer to their government. There's a lot of trust that needs to be built among people who don't naturally trust each other, if we're going to have a chance of making state government serve its residents over the long term. I hope that showcasing state issues periodically here will make a few more people think about how state government affects Dryden, and who knows? Maybe some of them will make a difference. This morning's Ithaca Journal reports on a candlelight vigil and dedication of a memorial for Bret Neff, the Harford firefighter who lost his life at a fire in Slaterville last year. The Slaterville Volunteer Fire Company, which also covers the Bethel Grove area of Dryden, received a $54,000 federal grant for fire prevention efforts. Jerry Carbo, running for Village of Dryden Trustee, has the first ad of the campaign season in this week's issue of The Shopper, and notes that the election will be March 15th from noon to 9:00pm. The Dryden Central School District is seeking community members who are interested in serving on the Board of Education. There are four seats up for election. Three are three-year terms and one is a one-year term. There's also an advertisement in memory of Bret Neff, for whom a memorial service was held last night. If you take your trash or recycling down to the Recycling and Solid Waste Center in Ithaca, there's an ad warning that all loads "must be covered by a tarp, canvas, net, or other device," and all trash cans must have lids. The picture shows a pickup truck. I doubt this applies to trash inside of cars. I would also like to mention that in our Dryden community, as in other local communities, bridges have been and are being built by churches, service clubs, individual volunteers and the schools so that together we can more effectively meet the comprehensive needs of our children. This is important work since it is the children who represent the future well being of our community and all other communities. This idea is not a new one. You've heard it before: "It takes a village to raise a child." To the extent that this occurs, a child will become, more or less, an asset to the community and to the greater society as an adult. Why does a town celebrate the accomplishments of a hometown hero? It is because the local citizens feel they had something to do with the hero's development. Together, let us raise a group of heroes! Also on the opinion page, Dorothy Manley of Etna writes that "It's hard for me to understand why, if soldiers are punished for torturing prisoners from Iraq, it would be O.K. for the feeding tube to be taken out of Terry Schiavo in Florida." The Farm Service Agency in Ithaca is closing. The Journal lists the nearest office to Dryden as Waverly, but the FSA site lists one in Cortland at 100 Grange Place. Briefly in Tompkins mentions a meeting about Six Mile Creek volunteer monitoring, to be held at 4-H Acres (map) on February 28th. Again, there isn't a time given, but "for more information, contact Tania Schusler at 272-2292." New volunteers are welcome, and will receive training like the training I covered last year in the spring. Military News includes two Dryden residents, Army Pfc. Gary D. Smith Jr. and Army Pvt. Nathaniel E. Peterson. Dean's Lists includes two Dryden residents and a Freeville resident. 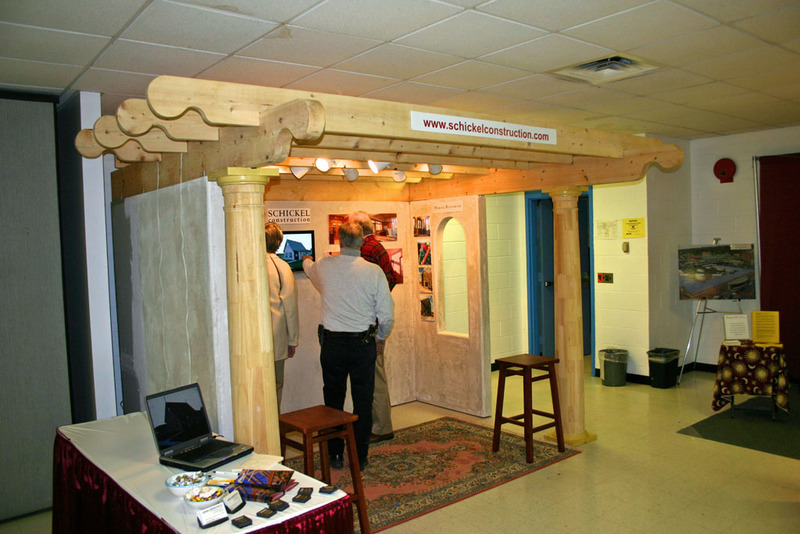 The Tompkins Cortland Builders & Remodelers Association are holding their 17th Annual Home and Garden Show at the National Guard Armory on Hanshaw Road (map). 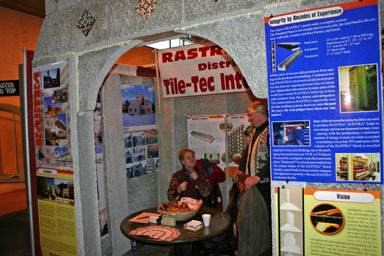 The show is open today until 8:00pm, tomorrow from 10:00am to 6:00pm, and Sunday from 10:00am to 4:00pm. Admission is $5.00, but the ticket is good for all three days. I wandered around and found everything from solar powered roofing shingles to architectural salvage to kitchen appliances to landscaping to fences. Two of my favorite booths were from Dryden companies, and looked rather different than the usual booth. Sergeant Matthew Cornell, who graduated from Dryden High School in 2002, helped rescue two Eqyptian technicians from kidnappers in Iraq on February 7th. Two of the three men who fled the vehicle were captured. "Taxing authorities have taken advantage of increased assessments by increasing revenue without having to raise taxes as much," Lane said. "People are being hit by a double whammy of assessment and tax increases. 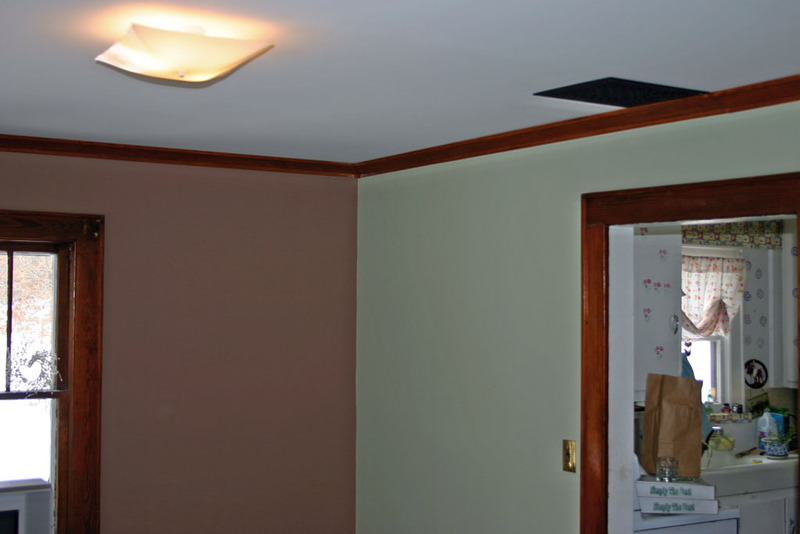 I think the process has put a lot of pressure on homeowners." The Town of Dryden's tax rate remained the same, for instance, while the tax levy rose 7.9%. With increased assessments, the tax rate would have had to fall for the burden on property owners to stay the same. Briefly in Tompkins and Local Briefs both mention the Dryden-Caroline Drifters snowmobile club's Breast Cancer Ride for Research today starting at noon at the Dryden VFW. No one has a right to express their view on anything by destroying a symbol that is held dear by you and so many others. It is like throwing blood on the United States flag. Darts & Laurels has a thank you from Elizabeth Callaghan of Ithaca to Eric Neilson and his son-in-law Erick, of Freeville, for helping her when her car was having trouble with ice on Baker Hill Road. Mayor Reba Taylor said Tompkins County Planner Ed Marks questioned the extension, but conceded the village was doing its homework with studies and with and effort to complete a comprehensive plan this year. That plan should be in place to enable village board members to have an informed discussion on what zoning changes might be made in the village. The Board also passed a law which requires "all cars parked in the village to have legal and adequate inspection stickers and license plates," with a penalty of $50 or 15 days in jail. Wakeman said the laws would have to be monitored on the local level, creating, essentially, an unfunded mandate for the local tax collectors. Mayor Taylor said the laws would also be a financial hardship, amounting to a $5,000 reduction in assessed property values for local taxes, which adds up to cuts in local budgets. One bill stipulates a $2,000 tax write off for volunteer firemen on their state taxes. Robert Witty said even the police chief and the village attorney had to serve on jury duty. "I think there's a better way of recruiting volunteers," he said. The Dryden School District is looking into ways to reduce the cost of buses. Transportation Director Dave Fuller presented a plan which changes the replacement cycle to maximize state aid and the buses' resale value. There are initial costs, but a much lower long-term cost. There's an article on Cornell Retired Volunteers in Service (CRVIS), retired Cornell employees who volunteer in school districts including Dryden and Ithaca. In sports, there's coverage of the Dryden Wrestling Team's performance at Sectionals, where three of the four Dryden wrestlers invited placed. I've been slack in covering the February Town Board meeting, and the minutes are now available if you want full details on what happened. Some key moments stand out in the meeting, so here are some highlights. I've bolded subjects for easy looking around. After a long search, the Town Board appointed Kimberly Gazzo, a Village of Dryden resident who works at the The History Center, to be Town Historian. A site plan review for JC Leasing, which would reuse existing buildings at the corner of Lower Creek Road and Route 13 for a DHL Courier office, was approved easily. A continuation of a hearing from May about development on Oak Brook Drive lasted over an hour. Nick Bellisario presented a stormwater management plan that was a huge improvement over what he had presented previously, but neighbor Susan Boutros had only received it two days earlier. She asked for another month to review the 200+ page document, but the Board moved forward with an approval while requiring landscaping improvements to shield her property from the effects of opening a self-storage facility. The environmental review passed 5-0, and the approval passed 4-1, with Councilman Chris Michaels dissenting. Highway Superintendent Jack Bush presented some early plans for improving the area around the Highway Department, including tree plantings and the conversion of the existing Town Hall into Highway Department offices once the new Town Hall is built. Plans for possible new highway department site improvements. In the County report, County Legislator Mike Lane talked about Northwest Airlines coming to the Tompkins County Airport in May, as well as about the meeting he called of property owners in the Cortland Road Sewer District, an area with increasing discussion about annexation to the Village of Dryden. He also discussed Town Clerks' concern about a request the County had made about the costs of collecting taxes, and stressed that this was just information gathering by an intermunicipal group, not the County planning to take over tax collection. County Legislator Martha Robertson discussed the possibility of property tax exemptions for owners who improve their house to provide access to disabled residents, as well as the early discussions on replacing the county property taxes with an income tax. said he would like a town committee established to look at the recreation opportunities in the Town and would like that committee to consist of himself, Jennifer Staton, Debbie Gross, and representatives from each of the town's centers (Ellis Hollow Community Center, etc). He would like them to meet and come up with a plan for recreation for the Town because it is not specifically addressed in the comprehensive plan other than to say the town is under with respect to recreational areas. He said there were good questions brought up at the last board meeting and he would like to address them properly. Cl Christofferson said the recommendation for our population is somewhere between 80 and 100 acres of town-owned recreational land and we have about 15 acres, so by national standards we are under. Cl Stelick asked Cl Michaels to also serve on this committee. Cl Hattery said he believes the comprehensive plan essentially says we need a recreation plan. Cl Michaels said it has been talked about with increased frequency since he has been on the board, and Cl Christofferson reviewed what was in the comprehensive plan. Atty Perkins said he understands that the Town has a contract signed with Empire Livestock and there is a provision that it is contingent upon the Board holding a public meeting within 30 days. The acceptance date for purposes of this is February 2 so it would be appropriate to schedule that meeting sometime prior to March 4. After discussion, the board decided to hold the meeting on March 3 at 7:00 p.m. at the Village Hall. Zoning Officer Henry Slater reported that the Virgil Creek stabilization money that FEMA has withheld should be on its way now that FEMA's objections have all been resolved, and they plan to finish work on the creek this year. He also noted that he and the Planning and Zoning boards had assembled a training program for their members, and that the Comprehensive Plan is making its way toward the Town Board. Environmental Planner Debbie Gross handed out copies of the Draft Comprehensive Plan to board members. The Board approved a contract for consultants on the proposed Dryden-Freeville trail, as well as an agreement that lets the Town of Caroline use Dryden's environmental planning services on an hourly basis. There was some discussion of the ongoing aquifer study and of Dryden's possible participation in an intermunicipal grant application (with Tompkins County, Danby, and Caroline) for conservation and management of their shared forest areas. There was also some discussion of land along Fall Creek coming up for sale that might be worth buying for conservation. The Board authorized the Supervisor and Thoma Associates to apply for funding for the development of a recreation master plan, which should fit well with Councilman Stelick's earlier suggestion about developing a recreation plan. The Town Board (unlike the Village of Dryden Board) voted to support various proposals being made at the state level providing "tax breaks and other enticements to encourage firefighting and emergency service volunteerism." The vote was 4-0, with Councilman Hattery abstaining because he hadn't had enough time to evaluate the bill. At the end of the meeting, after an executive session, the board approved re-publishing "the press release indicating the Town's willingness to partner with someone who is intersted in purchasing the golf course for certain specified public purposes." As Joe Osmeloski pointed out at the hearing on the Draft Comprehensive Plan, the golf course will be up for auction on March 11th. The Town Board will be meeting twice this week. The first will be on Wednesday, March 2nd at 7:00pm at the Dryden Village Hall (map) in joint session with the Village Board to discuss an annexation petition from Dryden Mutual Insurance, which would like to join the Village to get municipal water. The second meeting will be on Thursday, March 3rd, and will be an informational meeting about the "purchase of property for town hall." It will also be at 7:00pm in the Dryden Village Hall (map). Now that I've vented my general concerns about New York State politics, it would probably be wise to report on what Assemblywoman Barbara Lifton actually had to say. 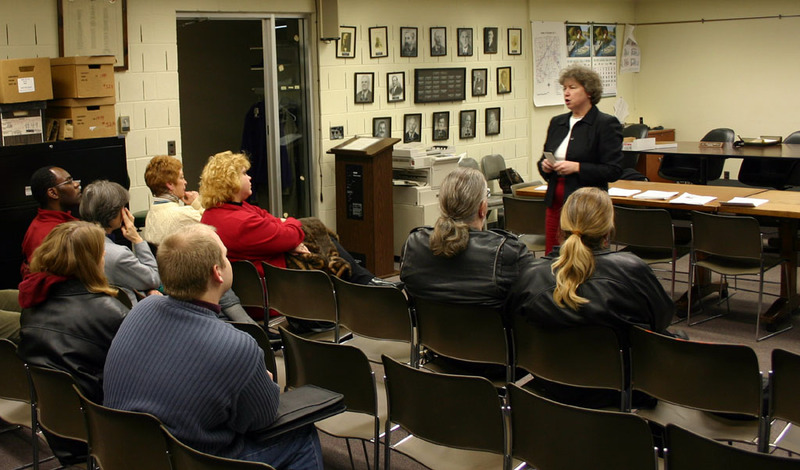 Assemblywoman Barbara Lifton talks at Dryden Town Hall. A lot of what Lifton had to say boiled down to a simple story but a difficult problem. New York State faces a combination of fiscal difficulties that make it hard to do the things we'd like to do. The federal government has lost its taste for progressive taxation and is trying to reduce its overall contribution to the states. As the federal government's role has shrunk, states have found themselves competing more directly with each other while seeing reduced money coming in from the federal government. New York adds to this formula a governor who wants to avoid tax increases at any cost, and who has taken to using the budget to change state law. The Court of Appeals has ruled that the governor's use of budgets in this fashion is legal, so it looks like we'll be facing more conflicts between the legislature and the governor as the stakes of the discussion increase. Recent court decisions on state education spending (or the lack of it) in New York City make the stakes even higher, as the state has to look for a few extra billion dollars. This set of conflicts doesn't play out strictly on party lines, though party sometimes matters. The Senate and the Assembly alternate between working together against the governor (as in the case about the budget they just lost) and working on party (or more complicated) lines. Lifton talked about cases where the two houses work together and cases where they don't. It was clear she was happy about cases where she had a Senate co-sponsor on bills she was sponsoring. A few of the budget cuts Lifton discussed especially distressed her. Pataki's budget cuts $85 million from SUNY, and that $85 million arrives at SUNY through tuition increases. The Tuition Assistance Program (TAP) is facing a 50% cut. (Update: I think this refers to the half-now, half-after graduation formula the governor is pushing through in budget language.) Medicaid continues to be a tough problem, especially as Medicaid provides a foundation to what Lifton described as a health system that's becoming more and more of a two-tier system. Medicaid funding keeps a lot of hospitals functioning, and the latest proposed cuts have set off alarm bells across the state. Lifton noted that "reform is now the most abused word in the language," as Medicaid 'reform' in the state is a questionable reform. Pushing my own interests in procedural reform, I asked a long-winded question (echoing my earlier piece) about whether New York residents had any hope of seeing New York State government act like a democracy rather than three men in a room. Lifton had some fairly hopeful-sounding suggestions, including that she had taken a look at gerrymandering and the prospect of legislative redistricting and was considering supporting Assemblyman Richard Brodsky's proposal of redistricting and a constitutional convention. Lifton also discussed her hopes for budget reform, which the governor vetoed but which can come to pass through another passage and a referendum. Dryden resident Nancy Munkenbeck asked Lifton about the Help America Vote Act (HAVA) and New York's slow movement toward a new voting machine system. Lifton expressed concerns that the Senate, while accomodating a list of IDs proposed by the Assembly, insisted on limiting the list so that new forms of ID would require new legislation, but did say that voting systems with a paper trail had supporters in both houses. Figuring out how that will work - one system for the entire state, or different systems for different counties - remains to be sorted out. A bill which would support a training initiative for rural elderly healthcare, using Ithaca College for a demonstration. A bill which would let voters over the age of 62 receive an absentee ballot without further proof of medical cause. Lifton noted that she had some law interns from Cornell working on other potential legislation, focused on economic development and possibly bookstores. One other piece I particularly remember was her description of the 67-page long school aid formula, while the Midstate School Finance Consortium is offering a formula that's only three pages long and much more comprehensible. This morning's Ithaca Journal reports on Saturday's Chicks Ride for Breast Cancer event, sponsored by the Dryden-Caroline Drifters snowmobile club, based at the VFW, and sponsored by a number of businesses including Googer's Coffee Shop, Stinky's Tank Service, J&B Stables, Shear Vision Hair Salon, and The Poor Shots. The ride benefits the Ithaca Breast Cancer Alliance. Assemblywoman Barbara Lifton has a guest column in which she takes a close look at this year's budget battle in Albany. In particular, she lists the amount of school aid local districts stand to lose under Pataki's budget: $73,382 for Dryden and $883,717 for Ithaca. If you've ever wished Dryden was more medieval, you may have neighbors who feel similarly, as a branch of the Society for Creative Anachronism (SCA) has grown in Cortland, or, as they prefer to call it, "The Incipient Shire of Courtlandtslot". There's also a group in Ithaca. Hopefully they won't feud over Dryden.